Poke Grill: Japanese Grill All The Way. Poke Grill is the 5th establishment under Poke Group, the company that owns all-Poke brands including Poke Sushi & Poke Express. Located at Rukan Permata Senayan (Patal Senayan, South Jakarta), it occupies quite a small space to accommodate only 30-40ish guests. 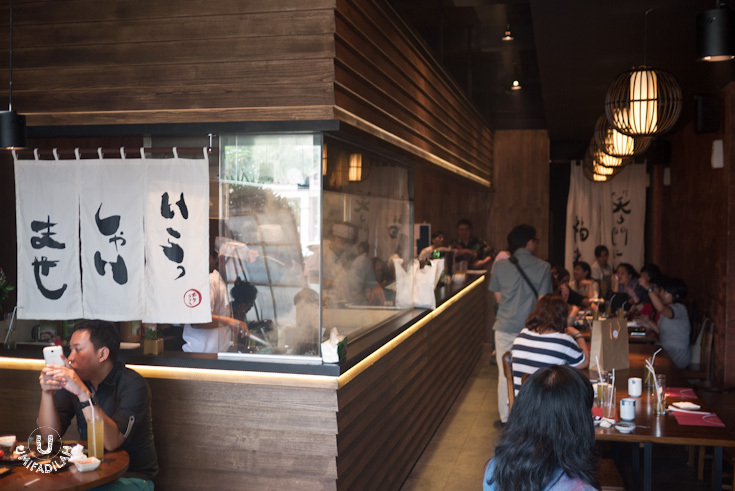 It has this typical Japanese ambiance hinted with wooden décor and an indoor open-kitchen concept, so you can see the whole grilling process. I went there twice, first as invited blogger on their soft-opening, and secondly as regular customer. This post combines both experience so I hope you'll get to see more reviews & thoughts. Their menu is pretty simple, actually. First they have Appetizers and Kushiyaki (grilled skewers) of chicken, beef/pork, seafood, and also vegetables. Then there’s 8 selections of Main Course. One set meal, and two desserts. That pretty much sums all. Let’s run through them one by one. 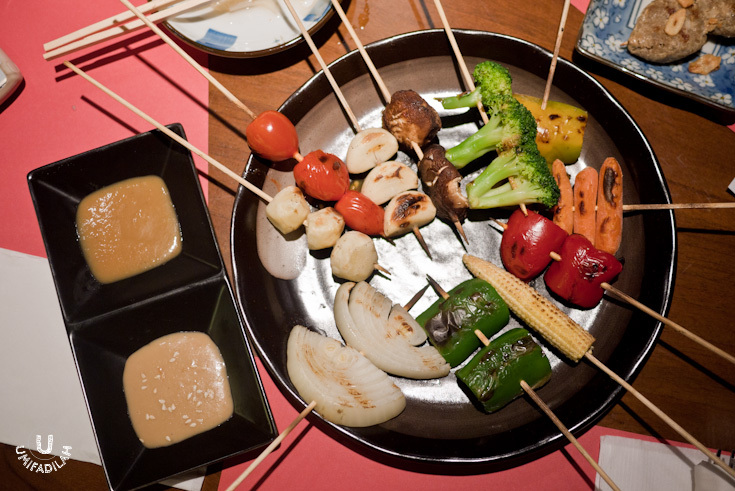 Assorted vegetable Kushiyaki called Yasai Moriawase (IDR 60.000). Three-colored paprika, carrot, garlic, tomato, corn, taro, shitake, onion, and broccoli. To me, it’s quite bland and needs to be charred a bit longer. That’s where the sauce comes to the rescue. The two sauces above are Goma Sauce (sesame) and Miso Sauce (Japanese fermented bean paste). 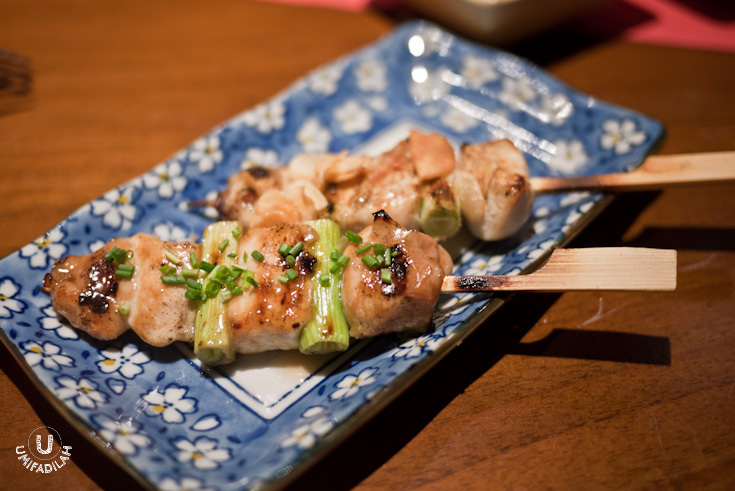 Yakitori (grilled chicken breast & scallions) – IDR 12.000. The front one is the sweet type, and the other one is the salty one. Loved the sweet ones more. From left to right: Tebasaki IDR 12.000 (grilled chicken wings), Salty Yakitori, Tori Kawayaki IDR 12.000 (grilled chicken skin). Great succulent wings! Gyu Tsukune (beef meatballs) and Maguro Tsukune (maguro meatballs) – all priced IDR 25.000. It was a bit dry to my liking. Assorted kushiyaki(s) from the Poke Grill’s soft-opening event. Overall their kushiyaki(s) are pretty decent, but not quite a strong contender to Sumiya’s kushiyaki. The ones at Poke Grill are a bit smaller in size, and too bad they don’t have the Ginkgo-seeds skewer. If anything, to me the 3 sauces are the true savior: Goma, Miso, and Sweet Sour sauce. Every main course menu is best accompanied with Teishoku (set meal). For IDR 35.000 you get Gohan (rice), small bowl of seafood soup, glass of ocha, and some lotus root side-dish. 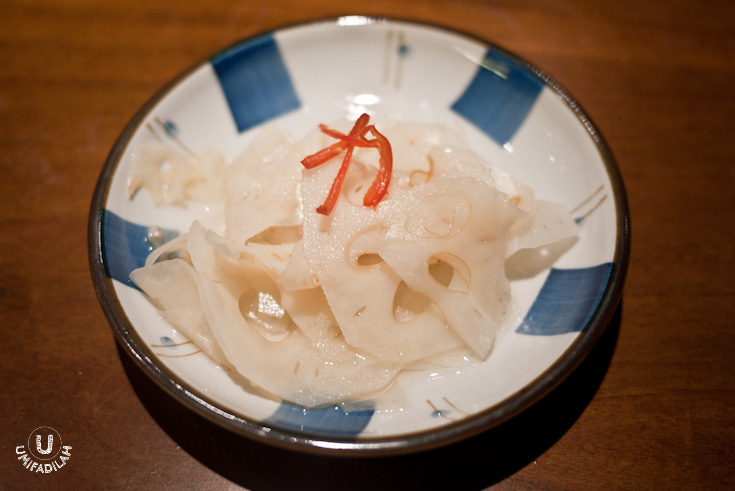 Renkon Amazu Yaki (lotus root with special sauce). My first time eating lotus root – texture is more like a crunchy radish simmered in vinegar, but overall it leaves quite a burning, spicy after-taste. Small bowl of Shifudosupu (shrimp, shimeji, mitsuba leaves, snapper and carrot). You can also order the big bowl (non-set meal) for IDR 25.000. The broth is the clear winner here! Light and tasty. There are only 8 main course options available: 2 lamb, 2 pork, and 4 fish dishes. Sorry to say but my friend who eats pork ordered their Grilled Baby Back Ribs & Pork Chops only to find out later that they were such a disappointment. The ribs seemed like they were pulled out from a really small rack, and the meat from chops looks quite sad, thin and dry. They might have had a bad luck that time, but hopefully it improves over the time (well, they must). So if you do come here, try ordering this one instead and I guarantee it won’t disappoint: the winning dish of Poke Grill, LAMB SHOULDER! Ramu Kata Niku (Lamb Shoulder) – IDR 79.000. The portion is quite generous, meat’s very juicy and it tasted really really nice when dipped into the Goma/Miso sauce. This is the one to order if you have a doubt about Poke Grill, no, seriously. Ramu Yaki (Lamb Chop) – IDR 69.000, served with cherry tomatoes, grilled garlic, and chopped mitsuba leaves. For less price comes smaller chunk of meat. Still, I’d recommend the shoulder for a better eating experience. A friend of mine, cutting through the 7-rack of Koushi No Ribu (Grilled Baby Back Ribs – IDR 150.000). 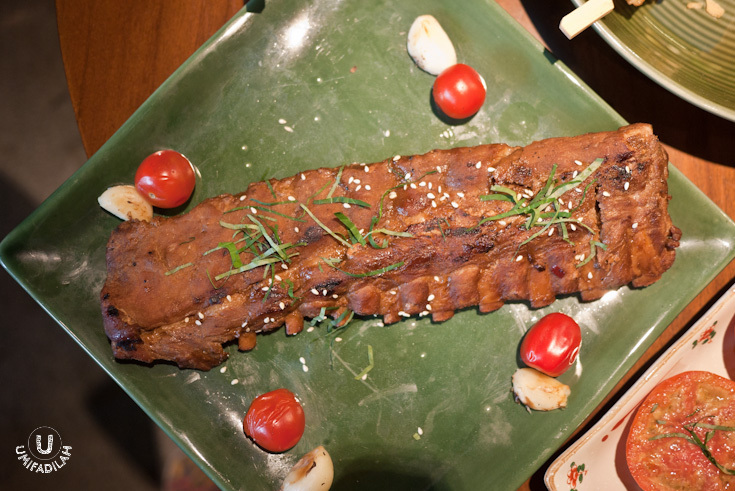 11-rack of Koushi No Ribu (Grilled Baby Back Ribs – IDR 195.000). I don’t eat any pork so now you have to judge yourself based on its appearance. But I thought that it looks too dry, and I had imagined a much bigger version of it. 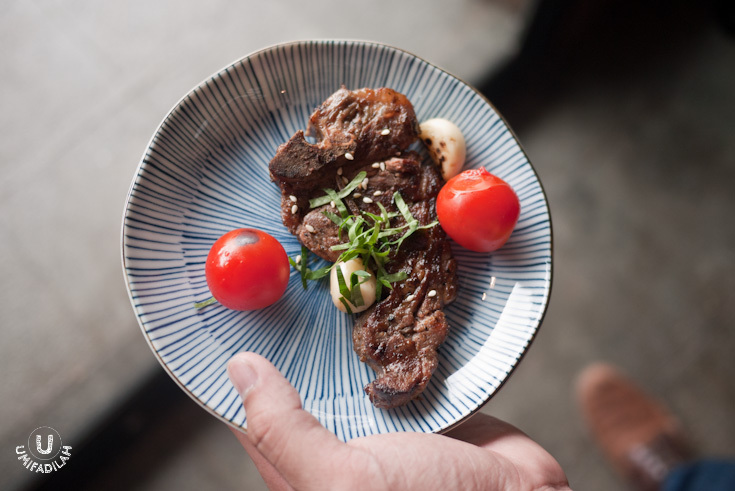 It is said that the meat had to undergo different steps of braising & grilling with akamiso (red miso paste), tobanjan (shili bean sauce), sesame seeds, mitsuba leaves, olive oil and lemon zest. Butaniku Garlic Yaki (Garlic Pork Chop) – IDR 79.000. Looks way thinner than I thought it'd be. Sunappa Yaki (Grilled Snapper) – market price, have to ask. Japanese, when it comes to grilling, likes to keep it simple. The fish is grilled as it is, without marinating steps at all. But instead, for every fish main course ordered, they’re giving Ponzu sauce for you to dip in the flesh. Works quite nice for me. Sanma Yaki (Grilled Sanma) – IDR 45.000. Looks simple and appetizing huh? The sanma flesh is white and delicate indeed. Great to dip in their Ponzu or Sweet Sour sauce. But, there is a BUT. You really need to remind the cook to make sure it’s cooked all through or else you’ll end up like me: got really turned off while butchering the mid-area of the fish, only to find out that some are still red & raw. Papaiya Yaki (Big IDR 55.000, Small IDR 25.000). It’s a combination of papaya, pineapple and apple (or was it pear? Not sure) – cooked with sweet broth like “Kolak”, then topped with baked meringue. Green Tea Jelly – IDR 15.000. There are only 2 desserts and this one makes more sense if you’re not the adventurous foodie. The small brown-ish dollop on the side is actually red bean paste. Honestly speaking, overall it’s a mixed experience. Yes I’d love to go back for the lamb shoulders, and maybe to try their Grilled Saba & Grilled Salmon Head next time. But other than that, everything’s pretty standard. They have to be more serious in terms of quality because what customers need to be paying is not cheap at all. Opens every day from 11.30- 15.00 WIB and 17.00 - 22.00 WIB.